A new ReSAKSS-Asia research brief evaluates the extent of agricultural mechanization in four townships in Myanmar’s Dry Zone. It provides evidence that rapid mechanization is underway. Mechanical land preparation is now common-place, due to thriving machine rental markets, falling equipment prices, and better financing options. 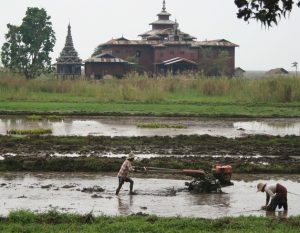 The mechanization of harvesting and threshing is also occurring but is concentrated in rice. These findings suggest that Dry Zone agriculture is at a technological crossroads. Agricultural mechanization is advancing rapidly in the Dry Zone. Already, most farmers use some form of mechanized power for crop production, but the mechanization process is far from complete. Machinery is used mainly for land preparation. Harvesting and threshing are performed manually for most crops, and even in paddy cultivation where mechanization is most advanced, these processes are only partially mechanized. This appears due in part to a lack of locally adapted machinery and attachment designs. Machine use has spread rapidly due to a thriving rental market, making adoption of machinery scale neutral. This has enabled smallholder farmers to benefit from mechanization, while generating income for service providers. Though relatively few households own machinery, purchases have accelerated over the past few years. This reflects the combined effect of rising labor costs and decreasing machine costs, making mechanization an increasingly cost-effective option. The availability of financing options has also boosted machinery sales.